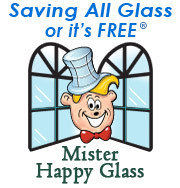 Mister Happy Glass can restore all glass to new. Scratches of any type: Chemical etchings, graffiti, water stained windows and spotted glass shower doors can all be removed at a fraction of the cost of replacement. Email Now! We utilize the latest techniques tested in some of the harshest conditions to assure our products and service are among the industries best. This makes sad glass that is dull and dingy, clear again like new and "happy glass". 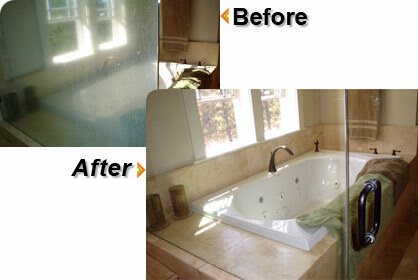 In fact, we've been recommended yearly by professionals to help their customers glass look clear once again. We use non-toxic bio-degradable Green technology as part of our service and guarantee our work and your happiness; or it's free. We also offer window washing so all your glass needs can be met at one time. Our service is done on site with a written estimate before we begin; and all work is completed in a neat and timely manner for your approval. Take a look at the following pictures which show a dramatic example of our money-saving service before and after. Call Today! All scratches on windows, doors and windshields. Corrosion from sources such as rain. At Saving All Glass®, our spot and stain restoration compounds along with our techniques are among the finest in the industry. Call our office staff to get a quick quote! As part of our service, we can often recommend and apply sealers and protectors that compliment our service and protect the glass from future issues. We use HydroShield. Call our office today to schedule a free estimate and complimentary whole-home window inspection. Pioneering the Glass Restoration Industry for nearly 20 years!